Two suspects were arrested on manufacture of meth charges following an investigation by Woodbury Police and the Cannon County Sheriff's Department. Arrested were Jeffery Randall Shelton and Donna Jeanine Campbell, both of Parker Street in Woodbury. They both face charges of manufacturing methamphetamine, maintaining a dwelling and possession of drug paraphernalia. Executing a search warrant, officers discovered Shelton standing next to a shop door. "Jeffery had a strong odor coming from his person and I could smell a strong odor coming from the shop," reported Investigator Brandon Gullett. Gullett and Deputy Jimmy Hayes stepped inside the house to clear it of other individuals. A search then began of the property. Discovered in the kitchen were two sets of digital scales and a strip of aluminum foil that had been burnt on the bottom with a residue on it. At that point, Campbell arrived and was detained outside the home with Shelton. Inside the bottom set of cabinets, officers discovered a black bag that contained the various makings of a one-bottle meth lab. "I then located in the kitchen on a wooden shelf next to the refrigerator a coffee can that contained two open cold packs, coffee filters and clear plastic baggies one with white powder inside," Gullett said. In Shelton's bedroom, officers discovered a locked safe that contained a tin that contained a knife, a set of metal scales and a clear baggie of white pills. Outside the house, in the shop Investigator Anthony Young discovered two one-pot meth labs that were still cooking along with coffee filters, aluminum foil and bottles of Muriatic acid. On the property officers found several burnt items including stripped lithium batteries, lighter fluid cans, blister packs and a Drano bottle. 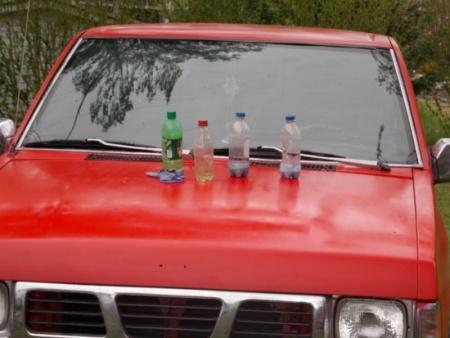 Inside Shelton's red Nissan truck, officers found a HCL generator, Shelton's state of Tennessee ID card, a receipt for purchase of pseudo, a strip of aluminum foil and a clear baggie containing meth. Tennessee's Meth Task Force officer Billy Jo Crouch arrived and took possession of the meth labs and trash. Both Shelton and Campbell were then taken into custody and transported to the Cannon County Jail where they were charged with manufacture of meth, maintaining a dwelling and possession of drug paraphernalia. A court date is set for June 4 in General Sessions Court. Participating in the arrest and investigation were Sheriff Darrell Young, Investigators Young and Gullett, Sgt. Steve McMillen, Deputy Jimmy Hayes, Chief Deputy Bruce Kirby and Assistant Chief Lowell Womack of the Woodbury Police Department.